Palm Cottage ~ This beautiful condo is just steps from the Beach! Enjoy a fully equipped vacation rental on Anna Maria Island. Just steps to the amazing beach and gulf waters. Aerial view of home from gulf side. Aeriel view of home from Bay side. Cute outdoor seating area. Parking right in front of unit. Welcome to Palm Cottage. Entrance to home. Living room area. Comfy sleeper sofa. Great views right out your window. Cozy Livingroom. Dining room table with room for 4. Dining area. Kitchen area. Plenty of space to make a meal. Side entryway. Bedroom view. Enjoy some TV time in bed. Comfy bed. Bathroom Washer/Dryer in unit. Just steps from the front door. Amazing gulf beaches Amazing gulf beaches Pier out front on beach. Amazing gulf beaches Close to gulf or bay. Palm Cottage is a beautiful vacation rental located in Bradenton Beach, just a few steps from the sandy beaches. This 1 bedroom rental offers a full size, fully equipped kitchen with refrigerator, dishwasher, microwave, oven, ample cookware and small appliances. You'll enjoy the beautiful terrazzo tile flooring, queen size sleigh bed, nicely furnished living room with pull out couch, matching dining room set. And the best part about spending your vacation in this rental is the distance to the beach. Anna Maria Island has some of the nicest beaches in the country, and yours is just a few steps away. 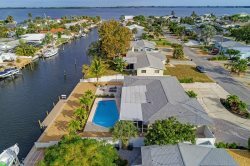 Palm Cottage is the perfect Bradenton Beach vacation rental that includes a free boat launch 200 yards away on Sarasota Bay. Take some time to get out on the town in the historic Bridge Street neighborhood with quaint shops, cafes and great restaurants too.